Port Elizabeth is one of the largest cities in South Africa and often chosen as a holiday destination due to the wide variety of attractions and activities it has to offer ranging from cultural and historical points of interest to Blue Flag Status beaches, stunning floral reserves, award winning wildlife destinations and a fabulous selection of retail therapy. 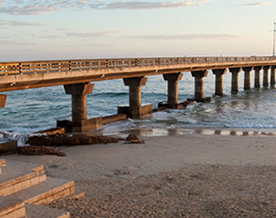 The beachfront promenade is a hive of activity where innumerable outdoor activities can be enjoyed and popular attractions, besides the beaches, include the Port Elizabeth Museum for a walk through time, Bayworld, to meet the seals and other marine life and the Boardwalk Entertainment and Casino Complex presenting much fun filled family adventure. The huge dome shaped Nelson Mandela Bay Stadium is sure to catch your eye and within the city suburbs there are numerous large retail outlets, the biggest and newest of these being the sprawling Bay West Mall that offers shops restaurants, cinemas and an ice rink and entertainment complex. On the outskirts of the city one will find unexpected gems such as the Kragga Kamma Game Park, a great, compact safari park where you are guaranteed of seeing plentiful wildlife including white rhino, giraffe, cheetah and plenty of plains game as well as the Cape Recife Nature Reserve situated on a scenic stretch of beach and considered one of the best places in the Port Elizabeth for bird watching. The reserve is also home to SAMREC, a penguin rehabilitation centre that will warm your heart and delight the kids. The Maitland Nature Reserve is a source of rich natural beauty, boasting a spectacular indigenous coastal forest and beautiful giant sand dunes, while the St Croix Island Marine Reserve can be reached by boat charter and is home to the largest colony of African penguins in the world. This area is also a popular scuba diving site, best enjoyed in winter when visibility is at its peak. 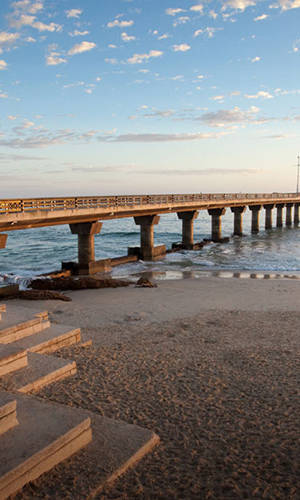 If your interest has not yet been piqued then you should also know that Port Elizabeth is host to numerous golf courses and health spas and is home to Ironman South Africa. Walking and hiking trails abound, the most popular being the Sacramento Trail, an eight kilometre coastal walk through the Schoenmakerskop-Sardinia Bay Nature Reserve; the Cormorant Trail, also beginning in Schoenmakerskop and the Roseate Tern Hiking Trail, taking you across the unspoilt dunes of Cape Recife.